Well, the last day of the conference is here. Today we have fellowship, worship and the Word. Duane Gryder preached today, and his sermon was all about works… I mean Grace… Well, actually it was all about how we are saved by Grace, and how the works naturally follow because we love our Lord, and all He has done for us, and will do through us. It was very good. After the service, we helped out a little with cleanup and then headed over to Lucky Dog for a light lunch. Good Stuff. Good Stuff. While we were there, we met a young man that recently moved to Austin from Indiana. We had a really nice talk, and I just had to take his picture, that is what I do after all. I like the effect of the colorful globe lights on his skin. Enjoy. Wow, another great day at the Christian unity Conference at the American Legion Hall in Round Rock. We heard two great sermons today, or maybe I should say four great sermons if you count the legislative updated from Bandido Gimmi Jimmy and Escondido Paul, both of which were also excellent. At lunch we headed to the Little Red Wagon Hamburgers Restaurant. I can see why this little old building is still in business, they do have great burgers. Oh, and they also have good air conditioning. The conference ran until about 5pm, then we had a break till the concert started at 6:30pm. The band was Southern Glory, a Christian Rock Blues band from the San Antonio area. Excellent sound! Tomorrow is the final day of the conference, finishing up with a Sunday service starting at 10:30am, and the Word at 11:00. Tonight was the first night of the Christian Unity Conference that is running all weekend. We started out with a time of fellowship, sort of a meet and greet, then rolled into worship with some great praise songs, and then we hears pastor Ron Baptiste brought the word. I had no idea what to expect, but I was certainly blessed. I particularly likes one of the saying he uses; “If God commissions you, then God will pay for it, and if you commission yourself, then you have to pay for it”. Hmm, I don’t think I can afford to go, unless God has sent me, and then I can’t afford not to go. After Ron spoke, we had a time of prayer. Wonderful! It all starts again in the morning beginning with coffee and donuts at 9:30am. I hope to see you there, you will be blessed! had to stop on the way home at Dairy Queen! The first annual Christian Unity Conference is this weekend, starting Friday evening at 6:30 pm and continuing through Sunday at noon. 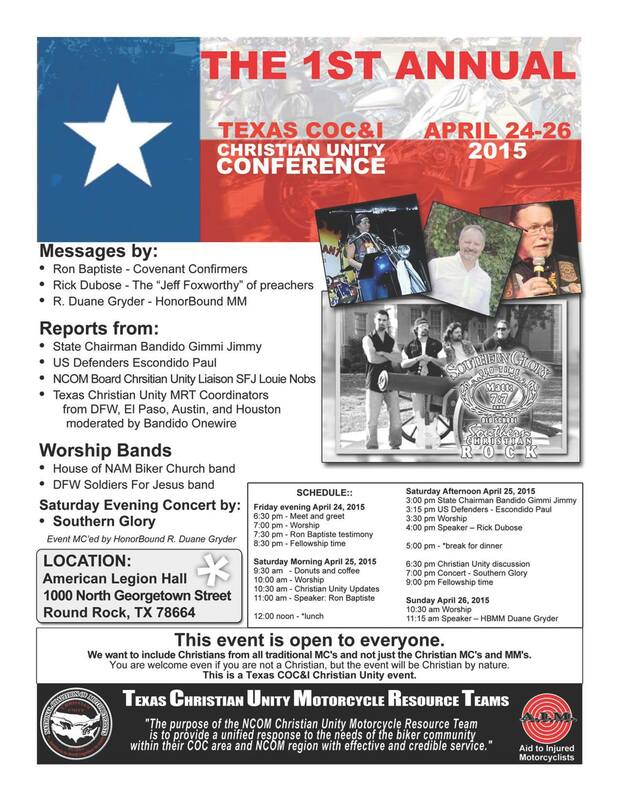 If you are a christian, ride a motorcycle, or are just interested in hearing some good preaches, speakers and music, come on out. On Saturday the conference gets into full swing with donuts and coffee at 9:30am, worship at 10am, and Ron speaking at 11am. It is going to be a great time, y’all come on out! Oh, it’s also free! We had Max’s Ride this morning at Cowboy HD in South Austin. As you probably noticed, the weather wasn’t great, but at least the moisture was a very light, on and off sprinkle. Debbie and I took the car as we usually do these days and we arrived just before 10am. First bike out was at 11, so we registered and hung around talking to people till the program started. We both took photos of course, or the program and the bikes leaving. Afterwords we…, I mean Debbie browsed the sportys. I think there are several she would like. Then it was off to enjoy the traffic working its way south. We stopped at P. Terry’s for lunch. Yum!